I need to open this article with a confession — as a kid, I was unfairly biased against historical fiction. No matter how much I enjoyed Johnny Tremain in the fifth grade, I just couldn’t help but feel like my pesky “education” was infringing upon my story time! Naturally (and fortunately), I got over that bias as I grew up; after all, A Tale of Two Cities qualifies as historical fiction yet also qualifies for my personal list of favorite novels. I guess that’s the secret of great historical fiction — it’s fiction first, historical second, and anything you learn while absorbed in the story seems purely accidental. Such is the case throughout Les Daniels’ The Don Sebastian Chronicles. Seeing as the purpose of this Blog Tour is to celebrate and promote all of Les’ work, I’m about to make another confession that I probably shouldn’t — my personal favorite of all The Chronicles is still Book One: The Black Castle. Truthfully, I suspect it was Les’ favorite, too; after all, it was the novel he WANTED to write, as he originally penned it as a stand-alone piece. Of course, The Black Castle was wildly successful, his publisher wanted more, and as such we were blessed with four sequels (but more on that number later). Still, the construction of that novel is utterly brilliant — place a vampire, the archetype of inhuman horror, in the middle of the Spanish Inquisition and watch who’s revealed to be the worst monsters (spoiler alert, it’s the humans acting in the righteous name of God). To me, that’s what sets The Black Castle apart from the rest of the series; while they are all amazing books, none of the others use their setting quite as powerfully as the first. There’s a separation practically right down the middle of The Don Sebastian Chronicles that I’ve always found interesting. The first three novels place Don Sebastian not just in a specific time, but immersed within a specific event (first The Inquisition, then Cortez’ attack on Tenochitlan in Book Two: The Silver Skull, and then the French Revolution in Book Three: Citizen Vampire). Books Four and Five take him to a specific time and place, but not necessarily into a historical event (Victorian London for Yellow Fog and then 19th Century India for No Blood Spilled, respectively). Moreover, Book Five is a direct sequel to Book Four, with the stories separated by a matter of months and characters other than the immortal Don Sebastian continuing in the narrative; that was a departure for Les in comparison to the gaps in the timeline of the first three novels, particularly the 200-year-plus jump between Books Two and Three. It was also a theme he apparently intended to continue (but again, more on that later). 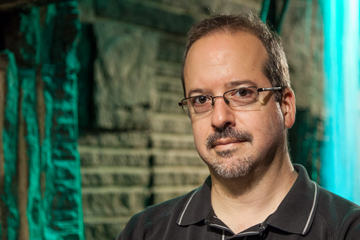 Les’ use of actual historical figures within his novels also changed throughout his series. In The Black Castle, Christopher Columbus makes what can only be described as a cameo appearance (and one, in my humble opinion, which was completely unnecessary and added nothing to the novel). This is quite a contrast to the very next book, The Silver Skull, where Hernan Cortez is an integral character and his actions play an essential role in driving the narrative. However (and again, this is just my personal opinion), Les’ use of historical figures reached its apex with Book Three: Citizen Vampire. While it’s hard to argue against Cortez’ importance in The Silver Skull, I simply prefer Les’ use of Robespierre, Dr. Guillotin, and particularly the Marquis de Sade in Book Three; I think that was the novel where he found the perfect balance, using his “real” characters for more than a cameo and yet also not focusing too much of his novel upon them. I’ve teased this topic twice already, so it’s time I cover it (and no, this is not a spoiler alert regarding Book Five because Don Sebastian dies and comes back a few times throughout the series anyhow) — by all accounts, Les Daniels had planned a sixth Don Sebastian novel. Once again, Book Six was apparently set to be a direct sequel to the events of No Blood Spilled, and Les planned to take his iconic vampire to Tibet. Alas, despite an EXHAUSTIVE search through his entire estate (which included mountains of papers and an electronic catacomb of digital materials), Les never wrote the book; all we were able to find was a hand-written outline of its plot, and that even culminated in TWO possible conclusions (he apparently hadn’t chosen which direction he’d go). One can only imagine what Les planned next for Don Sebastian, but at least we know where he planned to take him. Which begs a fun question, which I sincerely hope fans of Les will pick up and discuss in the comments section of this article — where would YOU have taken Don Sebastian de Villanueva next (either after the events of No Blood Spilled or after the presumptive events of the never-penned sixth book)? Les was fast approaching the dawn of the 20th century in his narrative, so essentially anything in the last 120 or so years would be open game. Bob Booth, Dan Booth, and I once kicked this very topic around, so I have my answer; if anyone picks up this ball and runs with it, I promise I’ll chime in with my offering in the comments section as well. And no, we’re not looking for a ghostwriter to pick up Les’ series; this is strictly the type of fun, intelligent, and learned discussion I believe would make Les proud. After all, any writer who packs so much research into his novels and creates such an informed narrative as Les did is begging his audience to use their brains and actually think about his work. Just a friendly reminder — The Complete Don Sebastian Chronicles are now available as e-books at NeconEBooks.com, so please order your copies today! The blog tour continues Monday, February 3rd, on author Mary SanGiovanni’s blog. 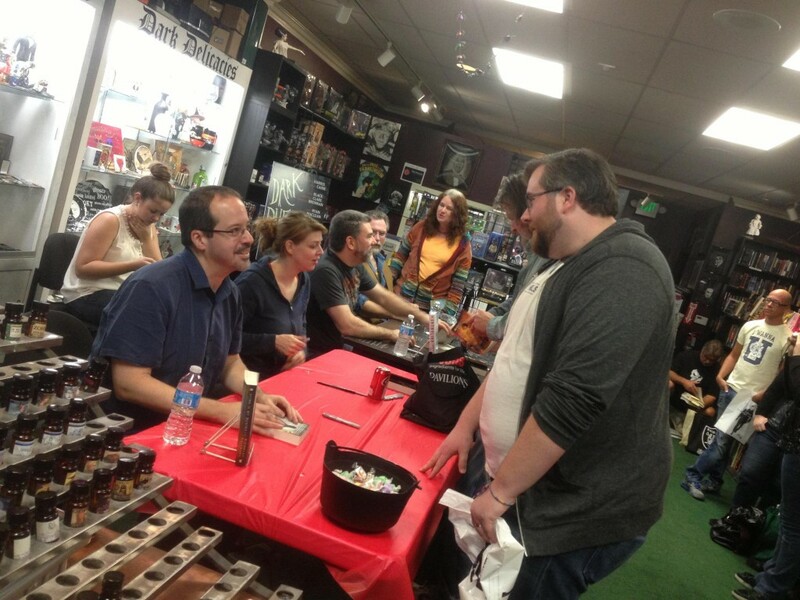 The book signing at Dark Delicacies in Burbank was the definite highlight of my trip to Los Angeles. My fellow authors Christopher Golden, Amber Benson, and Jonathan Maberry were charming and gracious company, and there was a much bigger crowd than I expected. Granted, I didn’t know what to expect because I’d never signed at Dark Delicacies before. Not only is it a beautiful store where an ostensibly grown-up Monster Kid like me can feel right at home, but they also have a loyal customer base of ravenous book readers and collectors who come out for the events. I was easily the author with the smallest following there, but the spillover was incredible. Lots of readers who had never heard of me before decided to pick up Dying Is My Business. 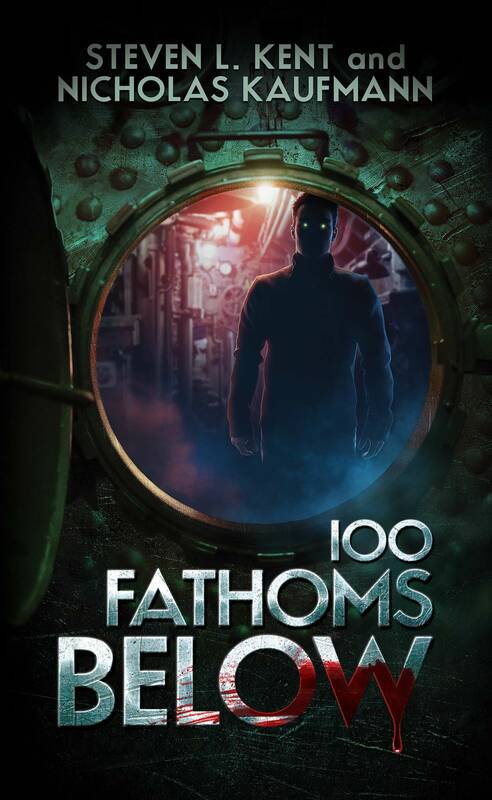 One fellow, a professional audiobook narrator, was so taken with just the first few pages that he’s going to lobby to do the audiobook narration himself! A woman who was there to get Amber Benson to sign a bunch of TV and movie collectibles from her acting career saw me and Amber chatting, figured that meant I couldn’t be all that bad, and bought my book for me to sign. In the end, the store sold out of copies of Dying Is My Business. 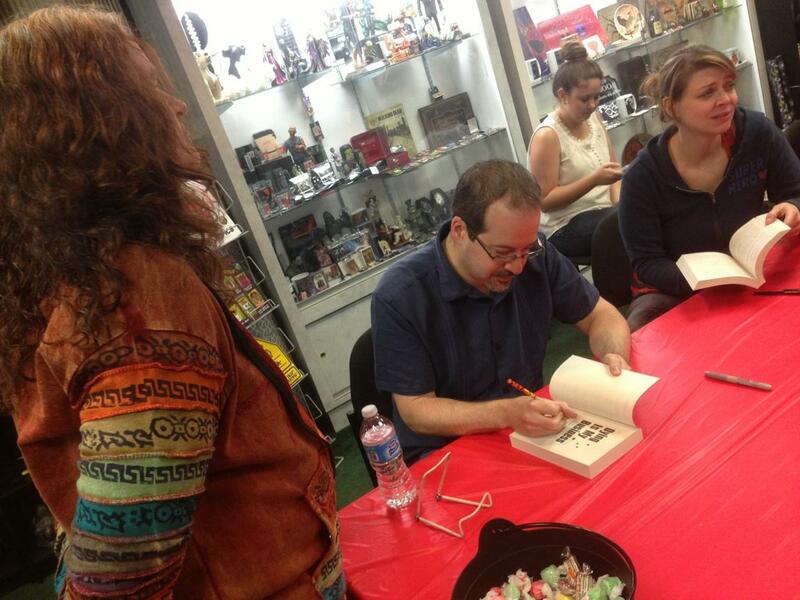 Needless to say, Dark Delicacies is now my favorite place to do a book signing ever. The signing table! From left to right: me, Amber, Chris, and Jonathan. Standing at the far end of the table, in yellow, is author and screenwriter Lisa Morton, who took a brief break from work that day to swing by. In the lower right corner, in the pale t-shirt, is the famous actor Paul Gosselin. Here I am signing Dying is My Business for Lisa, while Amber makes her “someone actually wants this guy’s autograph?” face. Another highlight of the trip was going out to dinner the next night with Chris, Amber, and actress/director Angela Bettis. Amber and Angela were absolutely charming dinner companions. Chris was there, too. Now I’m back in bitterly cold Brooklyn and missing the sunny skies of California. They say there’s no place like home, but for a couple of hours at Dark Delicacies, it sure felt like home to me. 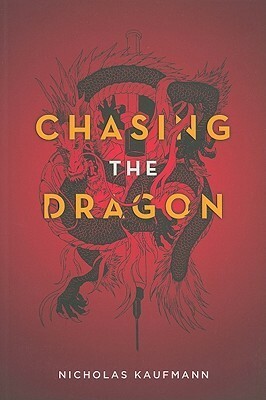 CHASING THE DRAGON Goodreads Giveaway! You know you want it! You have to live in the US or Canada to enter. Giveaway ends midnight on February 4. Get to it! Giveaway ends February 04, 2014. An honest and charming memoir by an amazing comedian that everyone kind of knows but isn’t sure where from. The glimpse into her life, especially her bedwetting youth, is frank and surprisingly touching. I’ve long maintained that Sarah Silverman is both misunderstood and underappreciated as a comedian. I hope this memoir changes that. However, I wouldn’t recommend it for anyone who is easily offended or faints at the mention of doody.